var options = new ScriptOptions(). /// Creates a new <see cref="T:Microsoft.CodeAnalysis.Scripting.ScriptOptions"/> with the namespaces changed. 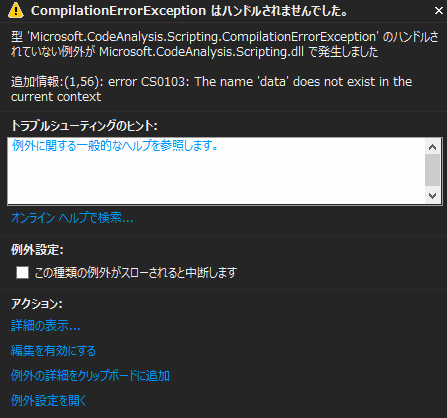 // "(1, 56): error CS0103: The name 'data' does not exist in the current context"
/// A <see cref="T:Microsoft.CodeAnalysis.Scripting.ScriptState"/> that represents the state after running the script, including all declared variables and return value.